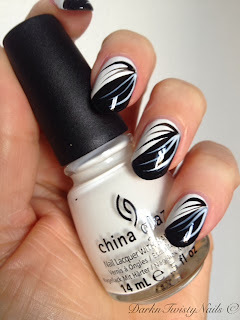 Today's Mani Monday's theme is a fun one: Newest Polish! 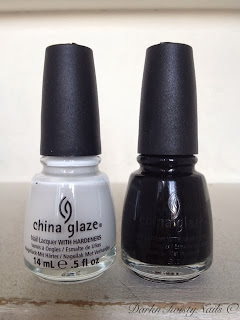 I love a black and white mani, but I was running out of my favorite black and I didn't have a true white, so I picked up a bottle of China Glaze Liquid Leather and Snow and, of course, those are my most recent purchase. 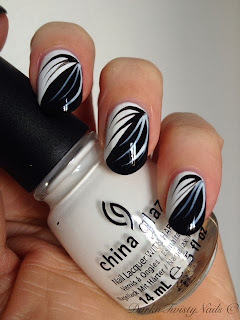 I debated whether to cheat and show another polish, but that wouldn't feel right, so I grabbed the black and white and started playing around with them. I started with a white base, so 2 coats of Snow. Normally white polish tends to be streaky and patchy, but this was not to bad. It wasn't opaque in 1 coat, but it wasn't as sheer as other whites I've tried either. 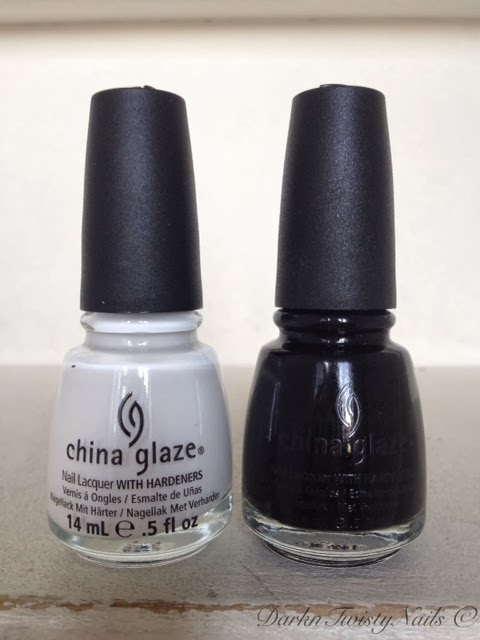 I followed with a second coat and then painted half of my nails black with Liquid Leather. This was a bit boring, so I got out my stripers and added some black and white stripes. 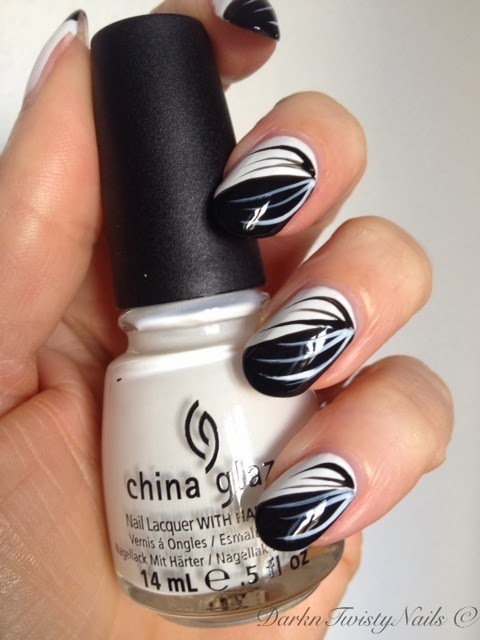 The result was a really fun and easy black and white mani. Liquid Leather has been my favorite black for a while, but Snow is a completely new addition to my stash and I really like it. 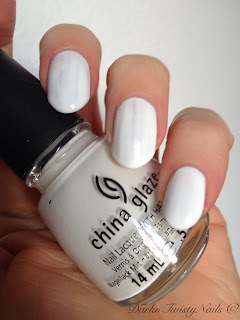 I always love the China Glaze brush and this formula was really good for a white. 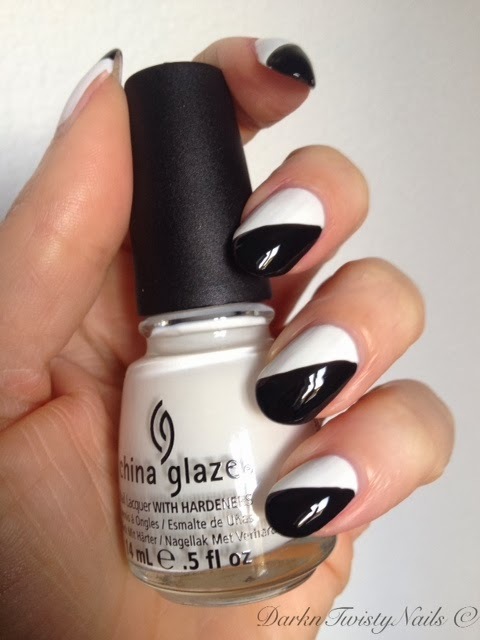 Maybe not the most interessting colors to show, but you can't go wrong with a black and white mani. What's your favorite black and white? Wat een prachtig ontwerp, heel erg mooi! Zwart wit zijn dan ook gave kleuren! This mani is amazing!! You are so artistic with your fancy techniques!! Nothing fancy about this though, just playing around with 2 polishes and striping brushes.